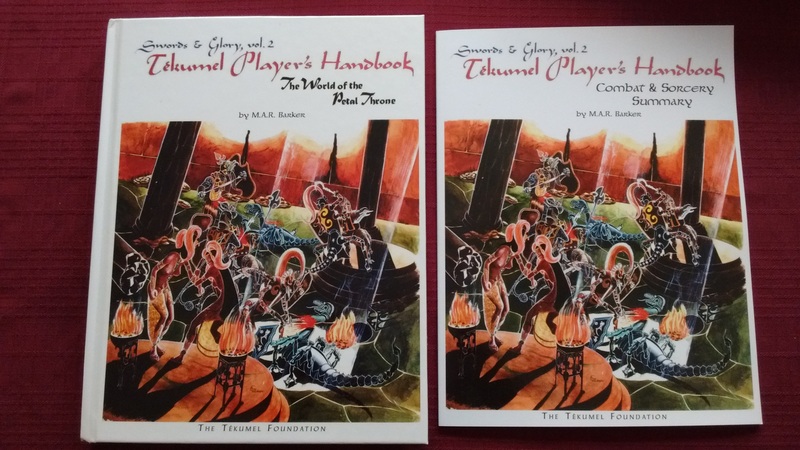 The proof copies of Swords & Glory Volume 2: Tekumel Player’s Handbook and the Combat & Sorcery Summary have arrived! The reproduction of the original cover art looks really quite good. After checking to make sure everything is correct, we will be releasing this for sale in the very near future. After that? Empire of the Petal Throne and Flamesong – things are developing! 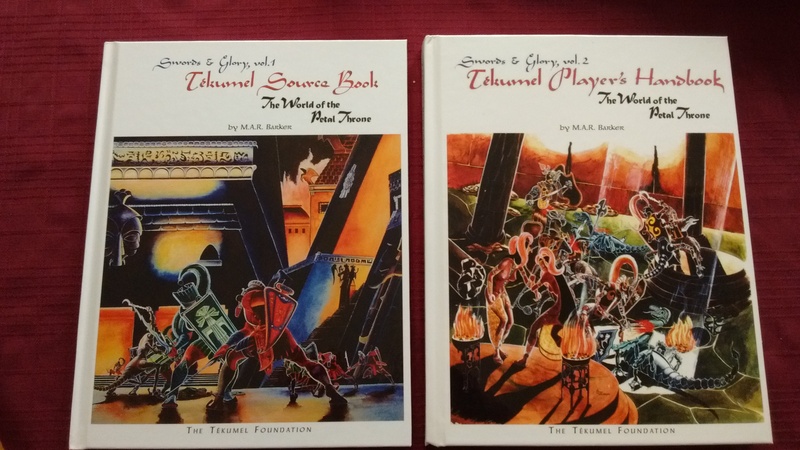 Below are copies of the Tekumel Source Book and the Tekumel Player’s Handbook, in their Tekumel Foundation editions. 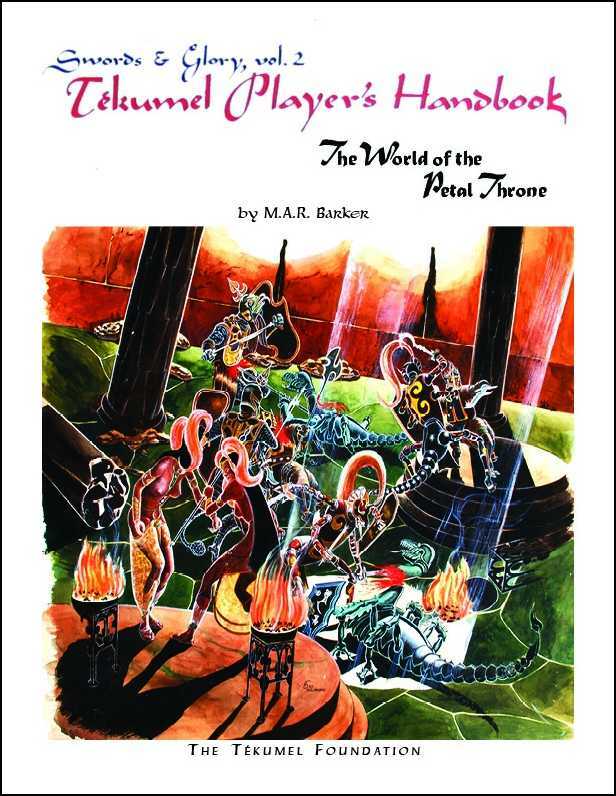 We also will release previously unpublished material, including the “mimeo” Empire of the Petal Throne in a print-on-demand format, the Jakallan Underworld, and Armies of the Five Empires. We will continue supporting Tékumel activities and events at conventions, including, but not limited to, the following list: Con of the North (Twin Cities, MN); Gary Con (Lake Geneva, WI); Convergence (Twin Cities, MN); Celesticon (SF, CA); Gamehole Con (Madison, WI), and U-Con Gaming Convention (Ypsilanti, MI). If you are interested in running events at these or other conventions, please let us know – we want to help make your event a success. 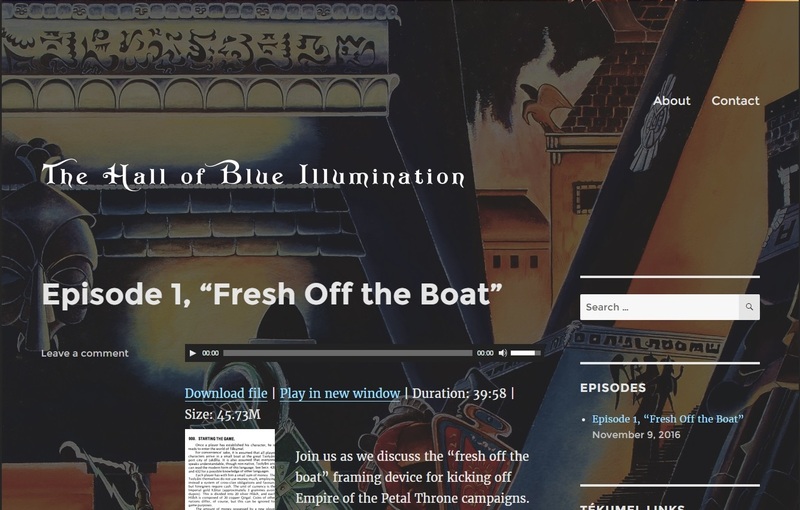 To accomplish all this, we want to spread the word about the world of Tékumel, through websites, podcasts, and other media. If you know of specific opportunities, such as the recent Conlangery podcast, get in touch with the Foundation and we can arrange to have a Foundation representative available. Lastly, we are always interested in proposals for new material related to Tékumel. If you’d like to license your product idea and are willing to work with the Foundation on its development, we want to work with you to make your idea part of the creative legacy of Prof. Barker – the world of Tékumel. Please contact the Foundation at info@tekumelfoundation.org – thank you!